Now there is an innovative way to help senior leaders understand the world from the vantage point of their chief executive officers. A new offering at the Kellogg School presents challenges facing CEOs as they advance enterprise-wide objectives by leveraging frameworks that drive success. It provides a unique leadership development experience that has top executives talking — to each other — with remarkable results. The program is an exclusive one developed in partnership with Corporate Leadership Center (CLC), a Chicago-based nonprofit created by Sheila Penrose and Cheryl Francis. It brings leaders from across industries to Kellogg for six intensive residential modules at the James L. Allen Center. Participants benefit from each other's insights, as well as lessons from Kellogg School faculty and CEO guest speakers. "During this time of increasing complexity and change, our purpose is to augment and accelerate the development of leaders running major businesses," says Kellogg Dean Dipak C. Jain. "By integrating the perspectives of prominent CEOs, Fortune 100 board members, leading academics and participants, we have built a powerful forum to advance the discussion and practice of leadership." The program, launched in 2005, welcomes its third participant group in January. It is meeting the needs of an elite market by "creating an atmosphere of trust and interchange," says Penrose. "This offering is unique in its combination of practical experience, cutting-edge ideas and the networking opportunities of participants themselves," says Penrose, who sits on several corporate boards, including McDonald's and Jones Lang LaSalle, where she is chairman. She also served as the first woman on Northern Trust Corp.'s management committee. Penrose and Francis, former executive vice president and CFO of R.R. 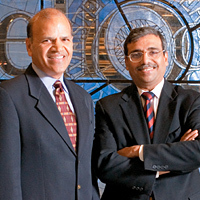 Donnelley and director of various Chicago-area boards, including Morningstar, met with Dean Jain in 2002 to discuss concepts for what became CEO Perspective. Early on, several chief executives expressed interest in the idea, says Raj Gupta, Kellogg adjunct professor and the program's executive director. For instance, John W. Madigan, former Tribune Co. chairman and CEO, joined the program's board when asked just as he was retiring. "I was able to reflect on my own experience," he says. "You always think you're ready for [leadership], but I wished that I had had more preparation [for my professional roles]. You can always have more." Which is one reason he is a strong advocate of the CEO Perspective Program. "You can learn so much from being in a high-powered peer group, and hearing from outstanding academicians and CEOs," says Madigan, a Northwestern University trustee. The program distinguishes itself in several ways, Gupta says. The curriculum is built around the CEO's agenda, those items that the chief executive and management team cannot delegate but must own, such as interdisciplinary issues like growth, customer focus, culture and others. The offering challenges executives to think broadly, says Francis, "to set aside a narrow agenda and take on the corporate agenda. The idea was to accelerate people's ability to do that quickly and efficiently." Boasting senior Kellogg School faculty who lead the experience, the program emphasizes interactive discussions, rather than lectures. "The executives all have deep operational understanding of their industries," Gupta notes. "They are co-creators of knowledge." To make this format work, Kellogg has designed the program for senior executives nominated by their CEOs or board chairs. Each must have either a profit-and-loss responsibility of at least $1 billion or "enterprise-wide responsibility for a major function, like finance or legal," Gupta says, and each must report to the CEO or COO. The format gains further power through the expertise of chief executives brought in as guest speakers. "The CEOs, our faculty and the participants themselves form three parts of a triangle," says Gupta. "It becomes a transformational experience for these folks." The program schedule fits a busy executive's life. The curriculum spans six two-day modules about six weeks apart with a longer break during the summer. The modules link the dimensions of thought leadership, team leadership and civic leadership and include: "Creating the Market-Focused Organization," "Driving Organic Growth and Innovation," "From Risk to Opportunity," "Expanding Boundaries," "Executing Visions" and "Leading in Turbulent Times." "Once they get in the classroom and experience this opportunity, they realize it is invaluable," says Nicole Schneider, product manager for Kellogg Executive Education. Daniel Diermeier, the IBM Distinguished Professor of Regulation and Competitive Practice, serves as academic director. He says faculty must bring all their creativity to bear in the program's classroom. "It needs to be very fresh," he says. "It requires a faculty member who can think on his feet." Diermeier says faculty must use their presentations to focus on the most important insights. Instead of spending the whole session teaching from published cases, they moderate discussions about events occurring in real time, as told by key actors. "As executives gain experience, they often have a desire to share these insights with their peers who have been in similar circumstances. This program is about exchange and interaction, rather than merely sitting to absorb a lecture," says Diermeier. "The learning points are the same, but how the content is delivered has changed — a crucial innovation that delivers value for our participants." "We practically never talk about cases, per se," Gupta adds. "We talk about what is happening today — emerging issues — but also with respect to the participants and how their businesses are dealing with current challenges." This interchange is "remarkably candid," says Gupta, thanks to an understanding that what happens in the program stays in the program. "Even though, in some cases, for instance, we have senior executives from Northern Trust and LaSalle in the same room. They know what subjects they can get into," he says. Jeffrey Rein, president and CEO of Walgreen Co., has experienced the program's benefits himself, and was so impressed that he is enrolling two more of his firm's senior executives. "The best thing about the CEO Perspective Program is that you share common issues, issues that you may not think are common," he says. "Then you find out that everyone there has the same issues, problems and opportunities. Everyone is looking for how to increase sales, increase profits, increase education and communication. You hear your peers' thoughts on how they are solving their problems, because in most cases the answers are applicable to you or your industry, just in a little different form." While senior executives have networking opportunities through groups like the Business Roundtable, and other executives, like CFOs, can network within their silos, nothing this cross functional exists elsewhere, Francis says. Rein says he appreciated this networking benefit. While participants would know the reputations of companies such as McDonald's or The Northern Trust, they would not necessarily travel in the same circles as those firms' leaders. "Without this experience, you would never have these discussions with them," he says. "When you get one layer down in an organization, that opportunity to network isn't there," Francis says. With the CEO Perspective Program, however, "all of the sudden you have 25 peers just as successful, in different industries, in different functional backgrounds." What's more, the networking continues after the program concludes, she says. Although many companies who participated have returned the following year with the next set of rising executives, about one-third of slots have turned over to new organizations, "which meant that the diversity of the participant pool got even better," Gupta says. This mix of industries gains an added perspective from the inclusion of two not-for-profit executives, who receive scholarships through a grant from the McCormick Tribune Foundation. "They've been very rich in terms of their contributions," says Gupta. For Rein, the program has lived up to its name by offering perspective on a host of strategic situations. In particular, he says, the discussions he and his peers enjoyed considered leadership's "unintended consequences." "A lot of times we do things and think something's going to go one way, and then something else happens," he says. "CEO Perspective helps you to think about the possible curveballs."